Melky Cabrera has three walk-off hits this season, leads the Yankees in batting average (.317) and just looks to be having a heck of a lot of fun. He did it again Saturday on national television where Joe Buck clutched his stomach in pain as he had too announce Cabrera's game-winning hit against Phillies closer, Brad Lidge. However, with Cabrera being on the most loved (and hated) team in the Majors and doing it on national television, his cards might shoot up in price. 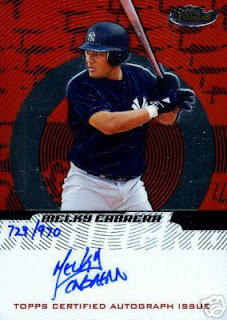 It could be a too late for Yankee fans to jump on the Cabrera bandwagon and snag his cards. Check out this card: a dual autographed Cabrera and Robinson Cano card, heroes of today's game. It's a nice looking card and at $21 with a little less than two hours left. Update: The card finished at $31. Well, since it's Memorial Day weekend, you may have time to find steals before everyone comes home on Monday night. Hurry! P.S. I'm still sick. That's why I've been MIA over the last few days. I have to say thanks for Marie for keeping the blog going by herself in my absense. Thanks. I'm going back to bed. Lidge is on my fantasy baseball team as well. I was very torn watching that inning. I hope you get to feeling better very soon!! Side note: my family is heading to NYC for vacation this summer and we have our Yankees tix in hand! We are very excited!! PUT THAT COFFEE DOWN MR. LIDGE!